Godliness with contentment is great wealth! (see 1 Tim. 6:6) So what does it take for us to be content? 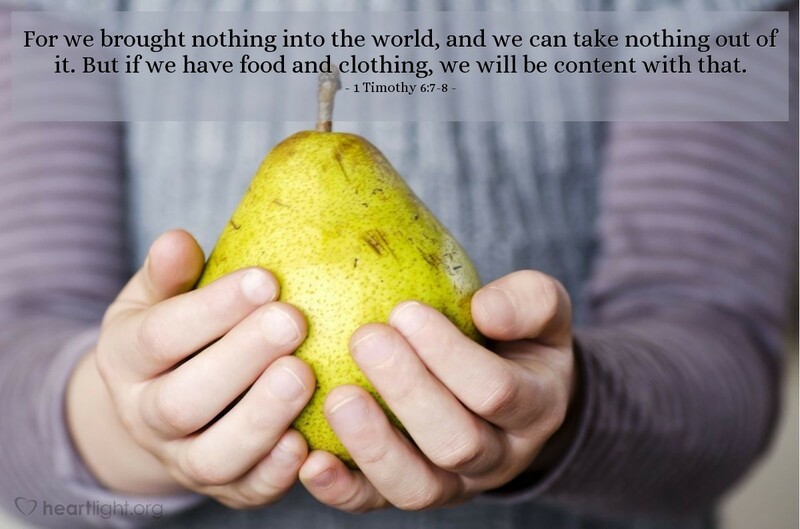 Paul reminds Timothy that as long as we have food and clothing, we should be able to be content. It's when our desires get out of that channel, when covetousness and greed take over, that our life gets out of control and we replace God with a hunger for what becomes our idol (cf. Colossians 3:5). God wants us to let him be enough and see the rest as the overflow of his grace! Holy God, forgive me for being caught up in the lifestyle of greed and covetousness, of excess and extravagance. Help my heart to be content with the blessings you have so lavishly poured out on me and to find my joy in you and your people whom you have put into my life. In Jesus' name I pray. Amen.